Caister North Beach BeachCaister on Sea's North Beach near Great Yarmouth has a long concrete esplanade and sand dunes leading to a wide sandy, golden beach. 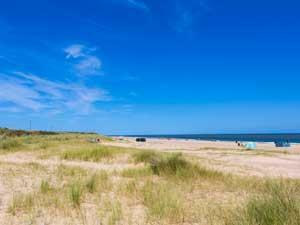 A small free car park is available alongside of the beach along with public & disabled toilets. Wheelchair access is available to esplande but further access onto the beach is limited. Ideal for dog walkers who can enjoy a pleasant stroll along the beach and dunes going up and along the sand cliffs to California. 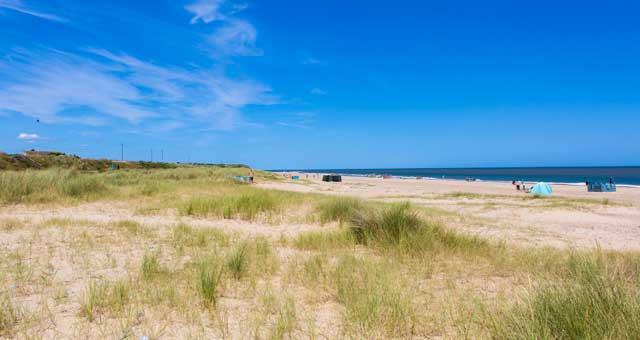 Caister beaches can also present good opportunities for surfing, particularly during the quieter winter months, best when the offshore winds are west southwesterly. On arriving in Great Yarmouth follow the signs for the A149 Caister-on-Sea. Follow signs through Caister Village turn right at traffic lights keeping church on you left hand side. Turn right into Second Avenue, after Centurion pub. Entrance to car park is at bottom of Second Avenue on left hand side. First Buses run a number of services from Great Yarmouth to Caister.